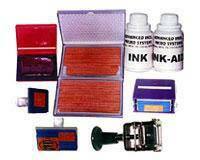 Leading Manufacturer of rubber stamp from Vadodara. PIC manufacturers various types of rubber stamps, groove rubber types, characters for coding and batch pritning. The advanced technology of PIC helps us to offer the best range of superlative coding ink, batch printers, overprinting inks, indelible inks, marker inks, Rubber Stamp ( for Coding / Marking / Stamping), rubber stereo types and Numbers, date Coding Ink, Number Holder, etc. to our clients We are engaged in offering a wide range of products, which includes Vertical type pneumatic coder(Top coder), Electro mechanical table top coder, Line extension coder, Aluminium body cartridges and Mechanical online coder inmark. With the help of our efficient workforce, we also offer Dry coding machine(Hot Ink Roll), Antifreez coding ink, Soft non-porous cartridges, hand operated coder and Online coder. These are appreciated for durability, optimum strength and excellent performance and are best value for money for your coding and marking requirement. Looking for Rubber Stamp ?